Interview with Sandra Gulland | Wendy J. Dunn, Award-Winning Author. WJD: Firstly, thank you for agreeing to this interview to discuss Mistress Of The Sun – a beautifully wrought novel. Sandra – it was a long wait for your readers between your internationally acclaimed Josephine novels and this already celebrated new novel. Was the Mistress of Sun a difficult book to write? If so, in what ways? For example, did you find researching Louise de la Vallière a challenge? 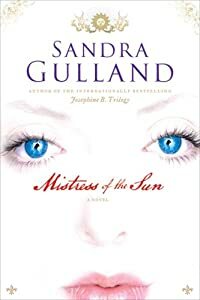 SG: Mistress of the Sun was an extremely difficult novel to write. I had been writing in first person for over ten years; I’d never written in third person, and I found it challenging. The third person voice is very elastic, and one has to be quite disciplined in using it. I learned this the hard way, through many, many drafts. It took a long time to research, in part because I was researching the entire period, laying the foundation for a series of novels, not just Mistress of the Sun. I had a hard time comprehending the 17th-century mindset. Napoleon and Josephine were very modern in their thinking; the people of the 17th century still had one foot in the Middle Ages. Louise’s story, in particular, presented certain challenges from a story-perspective. She becomes a nun: this, in fact, was a victory for her, a fulfillment of her true self, something of a leap for freedom—but it’s difficult for a modern reader to see it that way. I needed the reader to cheer her in this: not easy. WJD: Was there one important historical non fiction book which really unlocked the door for you to Louise and her life? SG: What an interesting question! The one book—or rather, one author—who unlocked the horse-story at the heart of Mistress of the Sun was George Ewart Evans. Almost two decades ago I read his two books, Horse Power and Magic, and The Days That We Have Seen. His description of the 17th-century use of “Bone Magic” to tame unruly horses set my imagination on fire. I’d like to mention, as well, Myriam Cyr’s Letters of a Portuguese Nun; Uncovering the Mystery Behind a Seventeenth-Century Forbidden Love. This beautiful little book helped me to see how rich convent live could be (silk skirts under the habits!). The Burdens of Sister Margaret; Inside a seventeenth-century convent, by Craig Harline helped me to see how crazy it could be, as well, and to understand that every convent was different, a world unto itself. A Social History of the Cloister; Daily Life in the Teaching Monasteries of the Old Regime by Elizabeth Rapley was a text full of what historical novelists love best: details of daily life. Descartes’ Secret Notebook by Amir D. Aczel was enlightening in that I learned that even Descartes, the founder of modern mathematics and the empirical method, believed that bad dreams were put in his head by evil spirits. The Adventures of an Italian Priest, written by Sebastiano Locatelli during his journey from Bologna to Paris and back 1664-1665, edited Wilfrid Blunt, has an amazing account of seeing Louise stand a cantering horse. Antonia Fraser’s Love & Louis XIV came out as I was finishing Mistress of the Sun, but it helped me to understand how important the King’s mother was to him. It’s a wonderful work, and I recommend it to readers. WJD: William Styron once said “While it may be satisfying and advantageous for historians to feast on rich archival material, the writer of historical fiction is better off when past events have left him with short rations.” What do you think? Does this boil down to an author’s own preference, that intensive research and “short rations” can equally provide the soil for the growth of a successful novel? SG: I often feel overwhelmed with the wealth of information available to the historical researcher today. I’m reminding of Tolstoy, hard at work on another novel after War and Peace. He was swamped with historical data and simply never finished. It’s true that detailed historical records can restrict a writer…but only if the writer allows it. WJD: The novel’s description at amazon.ca describes Louise as eccentric. Why is this so? SG: I don’t think Louise would be considered eccentric today. She would be viewed as spirited, a tomboy, a woman with an intense and lively intellect. Then, yes — I think she would have been seen as “different,” out of the mold, in particular because of her passionate affiliation for horses, which was a man’s domain. WJD: Would you describe her as eccentric, too? SG: I would call her spirited. There is evidence that she had, as well, a psychic facility. That might make her considered eccentric, today, but I wouldn’t see it that way. WJD: Why do you think Louise de la Vallière captured the heart of the king? SG: In short: because she was something of a wild child. And intensely honest. There was nothing of the courtier in her, no courtly ways. Louis was passionate about life in the wild, and Louise was his perfect companion. Too, she loved him for himself, not for his crown. That was rare at court. WJD: “The horse” plays an important role in this novel – not only as a force in the storytelling, but also metaphorically and symbolically? Can you tells us more about this please? SG: The horse, Diablo, plays a central role in the novel, even through he disappears for much of it. I see him as representing untamed spirit. WD: Ancient magic is also part of this story. Did you always mean to include this in the story, or was it one those things that just happened? SG: I think it just happened. At the time I was researching the story of Louise, I was researching 17th century horsemanship and, in the course of events, Bone Magic. Everything just came together irritably. WJD: This is your second major work bringing to the fore a fascinating woman from the past. Is it your preference to give voice to the story of long ago women, rather than to men? Why? SG: There are some male characters I’m interested in, but I’m not sure how I would write about them. Certainly I’m more familiar with a female world, and, too, I’m more drawn to their history. However, I may brave the story of a male main character some day. WJD: Do you know yet the subject of your next project? SG: I’m considering one, two, three … it depends on the day. The front-runner on most days is La Grande Mademoiselle, the King’s cousin and an early feminist. Another possibility would be Mlle de Oeillets, hand-maid to Athénais: she was Athénais’s go-between to the witch Voisin for magic charms and powders (and possibly poison). While in Ahténaïs’s employ, she had a child (or two?) by the king. Perhaps for this reason she was curiously untouched by the trial into the Poisons Affairs. And yet another possibility is a male: short, ugly Lauzun, Athénaïs’s friend and enemy. Of course, it might be about all three. WJD: Do you think that history fiction is deliberately made more palpable for today’s “Celebrity news hungry” reader? That is, publishers believe readers are not really interested in the truth, as documented by history, but rather a distorted reality that shocks and titillates? SG: I personally long to see reality history. Now and then we do get it — I think the recent “Pride and Prejudice” was excellent. But shocking and titillating seems to be what the public wants. WJD: Thank you so much, Sandra!